Item #BR168316 - Signed Coro Pegasus Goldtone Vintage Estate Antique Designer Link Bracelet. Signed Coro Pegasus pretty vintage designer bracelet composed of eight links. Each link has textured gold nugget motifs contrasting the swirling high polished goldtone ribbons. The links allow the bracelet to drape beautifully on the wrist. The links allow the bracelet to drape beautifully on the wrist. 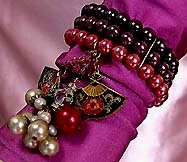 A well-made, high-quality vintage designer bracelet for lasting enjoyment. Excellent condition. A fabulous bracelet to wear at weddings, prom nights, pageants, parties, cruises and special functions! US$148.00. 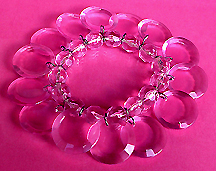 Item #BR168321 - Pastel Pink Lucite Disc Vintage Estate Stretch Bracelet. Flaw: One disc missing. Not noticeable. Size: Stretch bracelet fits any adult size wrist. This wonderful vintage lucite bracelet has pastel pink glitzy faceted large beads and transparent flat discs resembling crystals. The charming discs are lustrous and smooth, they overlap one another for volume, drape beautifully and clatter when moved. So pretty, quirky and fun! The faceted bead is 1/2" each and disc is 1". Please see matching necklace. Excellent condition. A fabulous bracelet to wear at weddings, prom nights, pageants, parties, cruises and special functions! US$78.00. Item #BR168236 - Multi Strand Pastel Pink Genuine Fresh Water Pearl Crystal Sterling Silver Vintage Estate Bracelet. Size: Length: 7". Width: about 1 1/2". Designer: Marked .925 on clasp. Beautiful multiple strand pastel pink luxurious genuine fresh water pearls, purple glass seed beads, ice clear and frosty pink crystals of various shapes and sizes encircle the wrist in noticeable lustrous volume. A sterling silver long tubular slide-in clasp holds these glorious strands from both ends. Absolutely divine! Excellent Condition. A fabulous bracelet to wear at weddings, prom nights, pageants, parties, cruises and special functions! US$168.00. Item #BR168322 - Antique Gold Bead Criss Cross Hand Wire Cuff Vintage Estate Antique Bracelet (Featured in Bridal Magazine!). 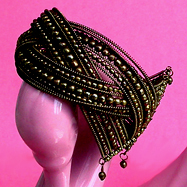 Breathtaking antique gold color hand wired vintage beaded cuff bracelet exudes an exquisite lacey, open appeal. Lovely domed crisscross design enhances dimension with dangle light small brass beads for teasing movements. Featured in Bridal Magazine January 2010 Issue! Excellent condition. A fabulous bracelet to wear at weddings, prom nights, pageants, parties, cruises and special functions! US$138.00. 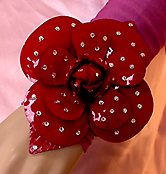 Item #BR168283 - Annie Sherman Huge Lipstick Red Rose Glass Seed Beaded Cuff Bold Bracelet. 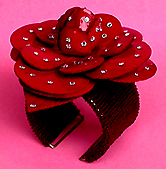 An over-the-top lipstick red huge rose is mounted on a filigree base to sit on a double layered ruby red glitzy glass seed beaded 2" wide bold cuff. The sumptuously lustrous vivid rose patels and etched leaves are dotted with glistening Swarovski clear round crystals of morning dews! Jaw dropping gorgeous rose 5" x 5 1/4", so bold, beautiful and one-of-a-kind. If you love jewelry that will make a loud statement, this is the one! Excellent Condition. A fabulous bracelet to wear at weddings, prom nights, pageants, parties, cruises and special functions! US$168.00. Item #BR168308 - Two Strand Pastel Blue Ice Crystal Bead Vintage Estate Antique Bracelet. Beautiful crystal faceted beads icy and clear they sparkle like gems! Pretty pastel blue color brings out the feminine side of it even more. Each bead is decorated with silver filigree caps and has a silver ribbed spacer bead on each end for further gorgeous texture. The exquisite silver filigree slide-in box clasp illustrates the designer's attention to detail! Excellent condition. A fabulous bracelet to wear at weddings, prom nights, pageants, parties, cruises and special functions! US$98.00. Item #BR168286 - Colorful Liuli Crystal Art Glass Floral Bangle Bracelet. This beautiful colorful Liuli crystal art glass bangle bracelet is exhibiting vibrant colors of the rainbow and illuminating brilliantly from within. Such striking colorant visual effect is achieved via a unique 16-step "lost-wax" technique (also known as pate-de-verre) accomplished only by highly skilled artisans. This exceptional crystal bracelet is not fragile and gives out a delightful crisp high-pitched tone when I tapped it lightly on another piece of glass. The exquisite floral etching is on the underside and reflects through the smooth shiny ice surface. My photos don't do it justice. Liuli Crystal Art Glass needs to be seen in person to fully appreciate its stunning beauty. Mint condition. A fabulous bracelet to wear at weddings, prom nights, pageants, parties, cruises and special functions! US$168.00. 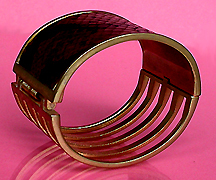 Item #BR168306 - Art Deco Faux Snake Skin Twin Design Versatile Vintage Estate Hinge Bracelet. Size: Inside circumference: 7". Width: 1 5/8". 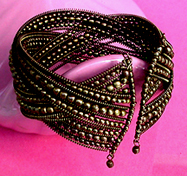 This unique vintage bracelet is not only gorgeous, it is also versatile. One side is a solid bold wide band and the other side has five symmetrical thick curved gold bands to please the wearer. Symmetrically Art Deco, smartly designed, unique and rare, very well-made for lasting enjoyment. Excellent condition. A fabulous bracelet to wear at weddings, prom nights, pageants, parties, cruises and special functions! US$138.00. Item #BR168238 - Emerald Green Gold Stone Goldtone Vintage Bracelet. The center row has unusual globular gold stones! They stand almost 3/8" tall, heavily faceted on top and glow brilliantly. These phenomenal tall stones contrast the low lying lustrous flat discs making it an interesting innovatively beautiful piece. The gold and green stones are gold foiled and backlass to further enhance glitters. This outstanding bracelet closes with an insert clasp and has a safety chain for security. A gorgeously well constructed hefty special piece indeed! Near mint condition. A fabulous bracelet to wear at weddings, prom nights, pageants, parties, cruises and special functions! US$128.00. Item #BR168224 - Three Strand Pink Purple Faux Pearl Coil Bracelet With Pendant. Materials: Vintage faux pearl coil bracelet, Art Deco cloisonne, cream glass pearls, large Aurora Borealis crystal bead, clear rhinestone rondels, a purple Czech glass bead and large red glass round bead. 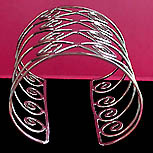 Size: Coil bracelet to fit adult wrist. Width: 7/8". Pendant: 2 3/8". 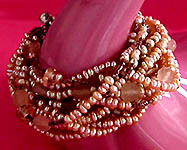 This beautiful three strand coil bracelet has lush faux pearls in shades of pink and purple. The exquisite pendant dangles two Oriental cloisonne pieces in a gorgeous Art Deco fan motif with impeccable detailing of red, pink, green floral designs. The gorgeous cream pearl tassel is adorned with a large sparkling Aurora Borealis crystal, purple Czech glass bead and glitzy clear rhinestone rondel spacers. A large surprise red glass bead (5/8") to draw attention! Jewelry reminiscent of the 40's era. Excellent Condition. A fabulous bracelet to wear at weddings, prom nights, pageants, parties, cruises and special functions! US$128.00. 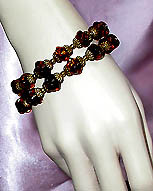 Item #BR168240 - Two Strand Antique Hand Blown Art Glass Amber Bead Goldtone Vintage Antique Estate Bracelet. Exquisite hand blown antique art glass large amber beads accented by milgrain fluted goldtone caps and gold beaded spacers creating beautiful volume and texture. Each hand blown antique art glass amber bead was formed slightly different and the sizes are not identical. They glow like gems and have hues of gold and amber interchanging effortlessly! Also note the simple and beautifully curved large connectors holding the two strands and the large antique spring ring closure from the 30's adding to the allure of a bona-fide antique treasure from way past. The art glass beads measure generously at about 1/2" x 1/2"! No chip or crack to the art glass. Excellent condition. A fabulous bracelet to wear at weddings, prom nights, pageants, parties, cruises and special functions! US$168.00. Item #BR168237 - Silver Plated Artistic Extra Wide Vintage Cuff Bracelet. Size: Cuff Bracelet fits any adult wrist. Width: 3 1/8". Beautiful symmetrical artistic curls and the unusual extra width dominate the design. Extremely well made and expertly crafted with decorative gleaming silver luster adorning the wrist boldly. 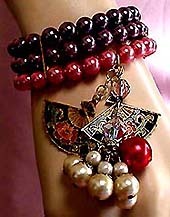 Hard-to-find 3 1/8" wide showy wearable art! Perfect for any wardrobe whether dressing up or down, you'll look instantly stylish as soon as you put this on! Near mint condition. A fabulous bracelet to wear at weddings, prom nights, pageants, parties, cruises and special functions! US$128.00. 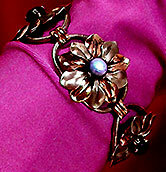 Item #BR16895 - Pink Crystal And Faux Pearl Goldtone Link Vintage Antique Estate Bracelet. Size: Length: 7". Width: 1 1/4". This bracelet is strikingly beautiful! 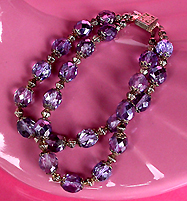 Three links of large glittering diamond-shaped pink, emethyst crystal beads and glass beads accented by sparkling large round and teardrop crystal rhinestones of green and purple colors. Also have pink art glass and a purple givre stone. All these gorgeous gems are mounted on three goldtone filigree bases with two strands of boraque faux pearls in between the links and closes with a decorative filigree insert clasp. Excellent condition. A fabulous bracelet to wear at weddings, prom nights, pageants, parties, cruises and special functions! US$148.00. Item #BR16814 - Antique Goldtone Bracelet With Clear Crystal And Cluster Faux Pearl Cornucopia Pendant. Size: 7" in length. Grape Pendant - 2 3/4"
Dangling from an antique goldtone textural chain is a charming bright goldtone cornucopia pendant of lustrous faux pearls and glitzy clear crystals denoting a bunch of sumptuous grapes. The beautiful cornucopia is a bright goldtone Florentined finish, is artfully curved at the tip and has a round, smooth faux pearl attached to it. The grape pendant is 2 3/4" long. So unique and delightful! Excellent Condition. US$128.00. Item #BR168270 - Signed Kreisler Two Tone Flower Vintage Antique Estate Link Bracelet. 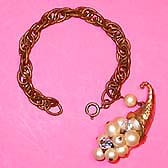 Signed Kreisler superb vintage link bracelet! Gorgeous two-tone flowers have shimmering silver and gold tone petals with a rich blue moon glow glass round cabochon secured by four fancy prongs mounted in the summit. 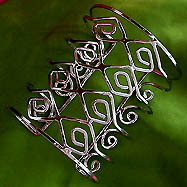 The flower links are domed for depth, dimension and beauty. Riveting solid construction of the 40's era for lasting enjoyment. Excellent condition. A fabulous bracelet to wear at weddings, prom nights, pageants, parties, cruises and special functions! US$138.00. Item #BR168262 - Art Deco Jet Black Glass Stone White Faux Pearl Vintage Estate Antique Link Bracelet. Flaw: Some slight scratches on one jet stone from normal wear. Not noticeable. Size: Length: 7 1/4". Width: 1". Exquisite links of glossy jet black rectangular smooth glass stones alternating the lustrous white faux pearl clusters form an attractive Art Deco symmetrical bracelet that has sumptuous dimension, unequivocal beauty and estate appeal. Excellent condition. 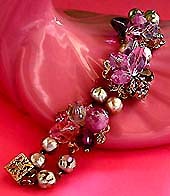 A fabulous bracelet to wear at weddings, prom nights, pageants, parties, cruises and special functions! US$138.00.